This review first appeared in the October 17, 1985 issue of The Daily Aztec. Those of us who got to hear Shadowfax live in the early 1980s had a chance to see some of the most exciting ensemble improvisation going. Now, their long out-of-print first album, from 1975, is being reissued by their current label, Windham Hill. The appearance of this musical time capsule shows us several things about Shadowfax. First, guitarist G.E. Stinson and saxophonist Chuck Greenberg have always been the heart of the band. Second, their interest in breaching the barriers between different styles of music goes back to the very beginning. 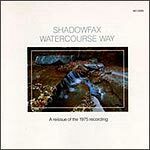 The songs on "Watercourse Way" are similar in structure and sound to the music on their most recent albums; the musicianship is also roughly comparable. "The Shape of the Word" is one of the best cuts on the album. Stinson's guitar solo is perhaps the best passage he's yet laid down in a studio, and Greenberg's work on recorder and lyricon is also as good as his best work. Interestingly, the rhythms on this first album are far less complex and interesting than those that have come since. The transcendental and dreamy "Book of Hours" by keyboardist Doug Maluchnik comes closest to capturing the group's later, more successful style. This is a must-have album for fans of the band. Not only is it full of some very good music, but it is the only snapshot we have of the band's early years.